I’ve just started a backpacking adventure across South East Asia and Bangkok was my first stop. It’s my first time visiting Asia and a bit of a culture shock at first. Despite feeling very chaotic and overly touristic in certain areas, Bangkok is full of exciting things to do and the people are super friendly. I quickly realised that there is something for everyone in Bangkok. From the street food stalls with plastic tables and chairs on the pavement serving a decent size meal for 30baht (£0.71/ €0.83/$0.95), to the rooftop bars with strict dress code costing upwards of 350baht for a drink alone (£8.33/€9.73/$11.04). I’ve recently quit my job so with a finite money supply I focused on low-mid price activities. I stayed near Koh San Road at a hostel called NapPark, it’s a great hostel for if you’re travelling solo with an excellent lobby area for meeting other travellers. 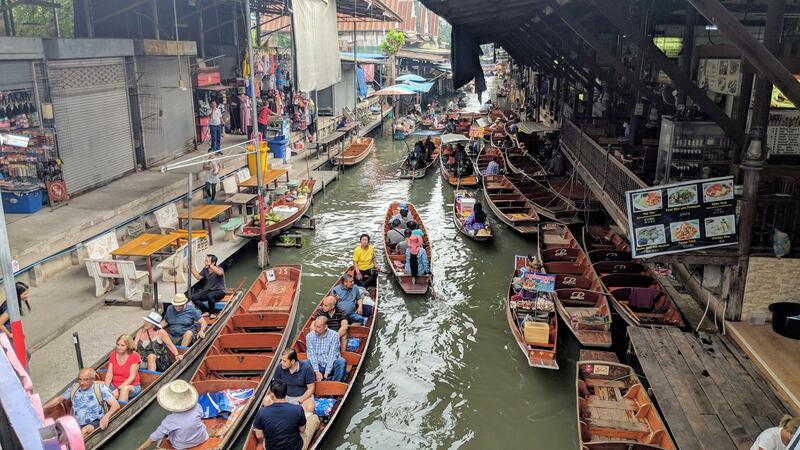 A trip to Bangkok is not complete without visiting a floating market. There are countless floating markets in the area, we visited Damnoen Saduak which is about a 2 hour drive from Bangkok. It definitely felt like more of a tourist market than a local Thai market but I still enjoyed the experience even if it didn’t feel completely authentic. It’s very impressive how the Thai people can cook food whilst steering a boat! How much to pay for floating market? : I’ve read a lot of negative reviews on Trip Advisor but often these people have paid far too much for the experience so can understand why they were feeling this way. I paid 300baht for a half day trip and an extra 150baht whilst there to go in a boat and think it was worth this price. The Grand Palace is the main attraction in Bangkok and one of Thailand’s most sacred attractions. There are huge statues and buildings spread across more than 200,000 square meters. Originally made from wood, the palace was later re built out of brick and stones and remained the home to the Thai royal family until recently. Entry cost to Grand Palace: I’ll admit that the 500baht entry fee is overly inflated compared to other temples in the area but if you’ve not visited before you’ll want to ensure you tick this one off the list. Don’t miss out on the nightlife of Koh San Road and surrounding areas. With all the restaurants, bars and street vendors, it’s a great place to get the drinks in and dance the night away. As it pulls in lots of tourists, prices on the strip can be quite expensive. We kept the cost of our evening down by having food and drink at our hostel and in nearby streets before heading to Khao San Road itself for the party atmosphere. You’ll see some questionable options for cuisine, including insects, crocodile and scorpions – will you dare? On my second day I took a day trip to the Ancient city of Ayutthaya. You can take a self guided trip as the train goes directly to Ayutthaya however the temples are not walking distance so you will either need to hire a bike or take tuk tuks between each. I chose to take an organised bus tour that takes you between each temple allowing time to explore each. This was about 2 hours drive from Bangkok so will involve an early start. Wat Maha That – This temple is well known because all of the heads of the Budda statues were removed when the Burmese invaded, one of which is now famously trapped in the roots of a Bayan tree. Wat Lokaya Sutha – There isn’t much left of this temple but it’s famous for having the longest reclining Budda statue in Ayutthaya and one of the longest in Thailand. Wat Phu Khao Thong – Shortly before lunch we visited this temple just outside the main city which had fantastic views across the Thai countryside. Wat Phra Si Sanphet and Wihan Phra Mongkhon Bophit – These two iconic Ayutthaya temples are situated together and were a great way to finish off the day, both remain well intact. Cost of a day trip to Ayutthaya: I paid 600baht for an organised day trip to Ayutthaya including lunch. After a day exploring temples in the Thai sun, a few hours are needed to recover. But as it gets near sunset, take a stroll to Wat Saket (Also known as the Golden Mountain temple) to enjoy views across Bangkok and watch the sun set. You’ll want to arrive at least half hour before sunset as there are many stairs to climb to the top and the sun in Bangkok seems to disappear in to a cloud of smog a little before it hits the horizon – delightful! When we first arrived at Chatuchak weekend market we thought it was a modest sized market. But as we wondered the never-ending network of stalls it quickly became apparent just how enormous it was. With over 15,000 stalls covering 24 acres, it is the worlds largest weekend market where you can pick up almost any item. Wat Pho was my favourite temple in Bangkok and is a must-visit attraction. I’d even rate it higher than the Grand Palace despite being significantly cheaper, entrance will cost 200baht. This temple houses the giant 46m reclining Budda statue which is far bigger in real life than I ever expected from the photos I’d seen beforehand, and it’s gold plated which makes it even more impressive. The rest of the temple is also incredible to explore, we spent a few hours walking around the whole thing. After this you can take a ferry across the river to Wat Arun. This is a much smaller temple but you can climb the steps to get a wonderful view. Entrance to Wat Arun is 50baht as it’s much smaller than Wat Pho. From Wat Arun, I’d recommend taking a river boat taxi to get a different view of Bangkok from the waterway. You can travel in either direction and it should cost about 20baht depending upon how far you travel. Did you know Bangkoks China town is one of the largest in the world? The main street is a lit with Neon signs, busy traffic and plenty of street food to try. You can also verge off the main street down the sprawling alleys of side streets, it’s a bit of a maze. I was advised to avoid the Shark fin soup as the way the shark fins are collected are usually very cruel but luckily this isn’t my cup of tea anyway. When taking a taxi, never accept the first price and try to use the meter as this is much cheaper. If you know about the journey in advance, it would be helpful to ask at your hostel or hotel for a rough guide on the cost. Dress appropriately for temples. The grand palace is particularly strict requiring long trousers for men and women, other temples generally require your shoulders to be covered and shorts down to the knees – check online or at the hostel if you are unsure.